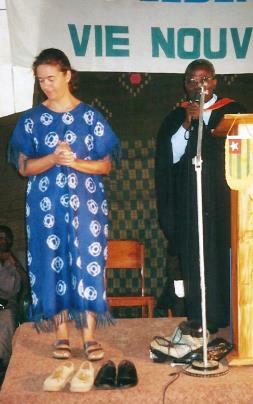 Beatrice Stockly, left, in Timbuktu in 2000. She was first kidnapped in 2012. UPDATE (11 Jan. 2017): A video released by Al-Qaeda in the Islamic Maghreb (AQIM) on Tuesday (10 Jan) shows a new proof of life of the Swiss missionary Beatrice Stockly, held captive in Mali. The 2’17” video shows a woman – her head covered by a black veil – who identifies herself as Stockly. Speaking in French, with a weary, barely audible voice and her face blurred out, she greets her family and thanks the Swiss government “for all the efforts they have made”. “I am in good health,” she adds. The video was allegedly recorded on New Year’s Eve. It’s the third piece of footage released by AQIM since her kidnapping in Mali’s northern city of Timbuktu a year ago. In late January 2016, AQIM claimed responsibility in a video for the kidnapping, which it said took place on 7 January. The group said it would free her in exchange for a number of AQIM militants jailed in Mali and one of their leaders, held in The Hague. Switzerland has demanded her release without conditions. AQIM released a second similar video in mid-June to prove she was still alive. Stockly, who is in her 40s, is a Christian missionary who was previously abducted by jihadists in northern Mali’s Timbuktu in 2012. On that occasion, she was freed about two weeks later, and opted to keep living in Mali. Al-Qaeda in the Islamic Maghreb (AQIM) has released a video, purporting to show that a Swiss nun kidnapped in Mali in January is alive and in good health. Al-Qaeda in Africa has claimed the kidnapping of the Swiss missionary Beatrice Stockly, who was abducted in Mali in January.